This may make me sound a little odd, but I really like cabbage. Not when it's been boiled too long and served plain, a la school dinners, but steamed until just tender and served with a little acid of some kind - lemon juice, vinegar, apple sauce, and chutney are all good - it makes an excellent side vegetable. My favourite kind of cabbage is red, with the tightly-formed heads. I'm not sure whether it really tastes any different from white or green, but it's so pretty when it's cut. It's hardly surprising that I should like sauerkraut, since this is essentially cabbage in acid, specifically lactic acid. Even better, from the point of view of making it, is that I don't even have to buy the acid myself, since, with a little encouragement, bacteria will make it for me. 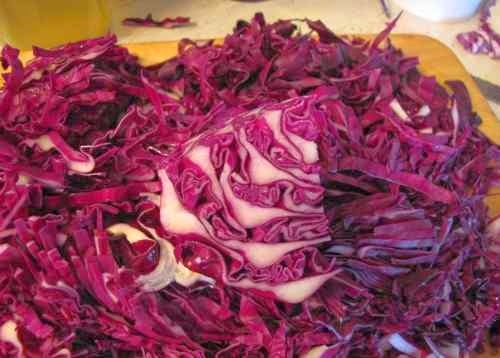 The process goes like this: I add a layer of finely sliced cabbage to a jar, sprinkle on a little salt, press down with a pestle, and repeat until the jar is full. There are no precise measurements involved, or indeed any measurements at all. To reduce the chance of mould growing on the top, I weigh down the cabbage with (washed and boiled) beach pebbles, which I sprinkle with more salt then top up with water before closing with an air locked lid. This might sound like overkill, but I get a lot of mould growth. It's all very well saying, Just scrape off the mould and discard the top layer, but if you ferment in relatively small jars, as I do, that top layer can be quite a high proportion of the total. Sauerkraut, before and after. Such pretty colours! As for the other fermented things, I've come to the conclusion that lactofermentation is not the best treatment for everything. It works well for cabbage, which is why this is a classic, and for unripe sloes, which is totally obscure (I haven't heard of anyone else trying it) but make a good alternative to olives. The important thing to bear in mind is that the fermentation process alters flavours in other ways than just adding acid. To my surprise, it completely destroyed the aniseed flavour of Alexanders. Wild garlic leaves work well, but the result is not a substitute for garlic, it's an entirely new flavour. Samphire kind-of worked, but the result was disappointing. I'll stick to vinegar for preserving this in future. Courgettes were successful, but I found that I don't really want to eat pickled courgette that often. 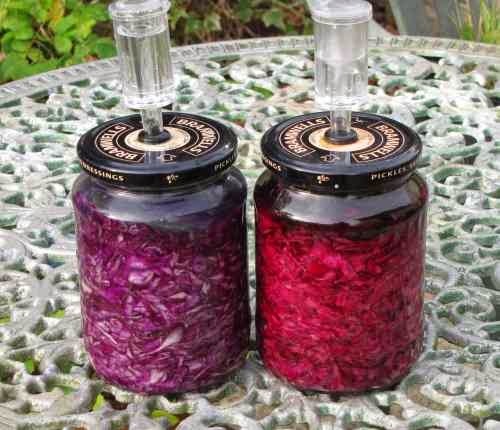 Do you ferment things? Have you come across anything that works really well? 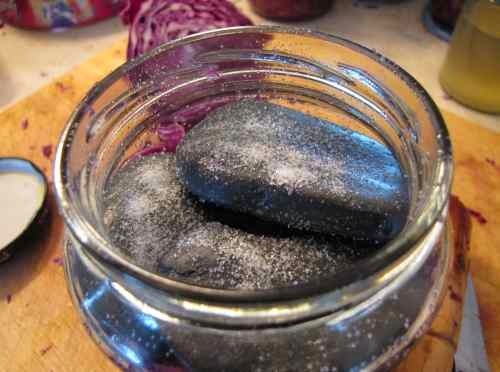 Overall, I've found that lactofermentation is a useful preservation method for some things, but it's not universal in its application. I still think it's magic, though. That's a shame - does that include vinegar? My problem with cooking in oil is that I tend to get distracted and let it brown, which really not a flavour I enjoy.